aka: Devo’s guide to figuring out Osiris. Mandatory Disclaimer: As with everything, this guide is exactly that- a guide. Gods can change rules at the drop of a hat, and my interactions with Osiris might not match your interactions with Osiris. This guide contains my own personal thoughts and interactions with this deity as well as interactions I have witnessed other followers experience over the years. This guide is merely meant to be a general overview for those who are new to working with Osiris. I’m currently in the middle of my Mysteries preparations for Osiris and I decided that part of my rites for this year would involved writing about various aspects of Osiris. I asked my readers and fellow Kemetics what they might want to know regarding Osiris and his mythology and it seems that not many people know what he is like, or what to expect when they work with him. I dug around on the Internet and found that there isn’t much on Osiris from a devotee’s perspective. He just doesn’t seem to get around a whole lot. So, to start off my Mysteries work this year, I decided that a general guide to Osiris was in order. So what is it like to work with the Lord of Eternity (Djet)? What can you expect when working with him? 1. Prepare to be trolled. When people ask me about Osiris, I like to make an analogy that compares him to Set. If your life is a house, working with Set is the equivalent of your house being hit by a tornado. You will likely wake up one morning to find that your house’s walls have been completely decimated and that you’ve got to start your house over from scratch. Set enters your life and takes no prisoners. He makes a scene and hands you a broom and expects you to clean up after him. Osiris, on the other hand, is more like a tree that is just outside of your window. It’s an old tree whose roots run deep. So deep that the roots are secretly infiltrating your foundations and you won’t realize it until there are cracks in your floor. 2. Prepare to get confused. A lot. I call Osiris Mr. Wingdings (as seen in this post here). This is because he speaks in riddles (the official language of the astral) and symbols and pictures. Often times, these pictures make absolutely no sense to me (or anyone else for that matter). I have not been able to confirm if anyone else experiences this from him, but I certainly do. For the first year or two that I worked with him, he said all of about 5 words to me. Everything else was through direct action (I do this thing to you with no explanation) or through imagery (duck-tree-canoe-oranges) that made no sense. I don’t know why he refused to talk to me, but such was the case- he almost never spoke. I only got his cryptic images. And that left me entirely confused. So confused that I quit going to him for advice because his advice never made any sense. And then one day he finally spoke. But instead of showing me the duck, the tree, the canoe and the oranges- he just said “duck, tree, canoe, oranges” and smiled at me. I have yet to figure out why he does this. 3. Be prepared to develop a lot of trust. Because Osiris rarely explains his methods, motives, or reasons, you can anticipate that you’re going to have to learn to trust him in order to get anywhere. I think this is probably true of most of the deities you work with, but the lack of communication and explanation from Osiris made it even more the case for me. For example, I’ve mentioned that a lot of our work occurs in a River. However, in order for the River to work, you’ve got to succumb to the water- which is a poetic way of saying that you have to drown, or die. You can’t do this without some trust. The first few times that I found myself being submerged under the water, I completely freaked out and put a stop to the whole thing. It was only through the development of trust in him and his motives and methods that I was able to move into the second level or step of our relationship. You may find that this is similar for yourself as well. 4. Expect Love to be a recurring theme. Love yourself. Love your neighbor. Love the cat. Love that plant. Love everything. Osiris is a man of making peace (in my experience- even though he is also known as the Lord of Dread in the Pyramid Texts). Many times I have shown up at the River angry and hurt. And many times he has urged me to forgive the people that have wronged me. To let go of the anger that I held in my chest and in my stomach. To let love take its place. Not necessarily the love of the person who wronged me, but to let my love for myself and my health to be more important to me than the anger and hatred for whomever or whatever has hurt me. This has culminated in his teaching me how to transmute and transform feelings like this into more neutral, happier feelings. Feelings of love and joy and contentment. For myself personally, this has been his biggest goal for me- to learn how to let go of anger so that I can replace it with love. 5. Expect to develop and receive patience. If there is something I can say about Osiris, its that the man is patient. You know the tree roots I mentioned above? That tree did not get those roots overnight. So it goes with Osiris. He is very much a Big Picture type of deity, and he will take as long as is needed to get what he wants. If you push away today, he will try again the next day, and the next day, and the next. And if method one doesn’t work, he will try method two, three, and 489358 until something works for you. His patience has been a blessing throughout my trials over the past year. However, you will need to cultivate your own patience with him. Setian patience is different from Osirian patience, though. You develop patience with Set because Set is chaotic and flaky and unreliable sometimes. You develop patience with Osiris because he is so steadfast. You can’t force him to change. You can’t goad him or push your weight around with him. He truly is like the pillar that represents him- he is stable, and to some extent, timeless. He may give you a cryptic answer and you will rail at him and scream and throw a fit and he will just smile at you and wait for you to calm down. Or he will pat you on the head and tell you that he knows and walk away. Sometimes his lack of emotion or reaction can be really really frustrating. But that’s how he is. And he doesn’t change for just anyone. So the patience you develop will be centered around that. Many people have described Osiris as being distant or uncaring, but I don’t think that’s the case. I just think that he is a quiet, more subtle deity, and that his methods of communication are different from what we’re used to. With enough time and patience, you can begin to hear his messages and you can begin to forge a relationship with him. Despite my setbacks in understanding him, I have definitely found that working with him has helped me to heal in a lot of ways, and Osiris has been a great support throughout the shifts in my religious practice over the years. This week’s Kemetic Round Table topic is a subject that is very near and dear to my heart. For this round, we are discussing the various aspects of UPG and Doxa within your religious practice. For those who are unfamiliar with the terms, UPG stands for “Unverified Personal Gnosis”. Generally speaking, it is a term that is used in many reconstructionalist paths to describe spiritual and religious experiences that aren’t necessarily backed up by historical record. A few examples of this (from my own personal stash of UPG) might be that Set likes dark chocolate cupcakes. If he’s not in business/working mode, he’ll show up in full out Japanese styled clothing. Or that Ptah’s capacity as a creator is where Osiris (stability) and Set (chaos) meet. None of these are necessarily backed by historical reference, however they have proven to be useful within my own religious practice. Doxa is a term taken from the Greek area of things and generally means “popular opinion” or “common belief” and is a starting point for the terms orthodoxy (standard, set in stone beliefs) and heterodoxy (anything that isn’t orthodox). Or, as someone described it to me: Doxa = Belief and Feels. Gnosis = Knowledge you can fact check. Of course, this means that the term UPG is a sort of paradox that really makes no sense, but that is another post for another time. I use the term UPG for the same reason I use the term “pagan”- its what everyone else uses, and it makes it easier for communication purposes. And for the purposes of this post, I will use doxa and UPG interchangeably. a. Knowing historical information about your deity and the Kemetic religion- as done by the ancients themselves. b. Knowing why you do what you do, regardless of whether it lines up with the historical record or not. The saying often goes that you should know what the rules are before you break them, and I think that this really does apply within your religious practice. Knowing how it was done, or know how a deity used to be approached back then is an important gauge for approaching the religion or deities today. As I said in my last KRT post, I think that having a foundation to build off of is important. The more you know, the more you can compare and contrast what you’re taking in. Discernment is an important part of any religious practice, as is a healthy dose of skepticism. Knowing the basics from antiquity gives you a good starting point for discernment with which to check what you learn. Knowing why you do what you do reinforces this. Now, this is not to say that gods can’t completely go against what was considered normal in antiquity. This can and does happen. They are gods, after all, and things do change- gods included. However, this means that when you do receive such tidbits, you can say that you know it wasn’t this way in the past, but this is what you’re currently being asked to do now. To me, knowing that UPG is, in fact, UPG is very very very important. Not only for yourself, but for those who come across your statements and might not know which is which. A good example of this would be Osiris’s article on wpwt-wiki which states that you are to never offer Osiris sand or fish, due to his brother’s associations. However, in antiquity, its said that fish were offered at Abydos (according to O’Connor) and sand was a common purifier in temple rites- including rites for the Mysteries, a holiday revolving around Osiris. Another common UPG is that Set can’t have water offered to him, due to his brother’s associations. However, water was commonly offered by priest and laymen alike. Both of these statements are modern doxa. They should be labeled as such. There is nothing wrong if Osiris shows up and tells me “I never want you to offer me sand”. However, for me to tell the rest of the world that that means that Osiris never wants anyone to offer him sand is misleading and, in my opinion, irresponsible. This is why labeling is important. This is also why having a good knowledge foundation is also important. We all need foundations to check things against. Whether you should let someone else’s doxa influence your practice is entirely up to you. When I read an interesting bit of trivia from another Kemetic, I mull it over for a bit before I jump on the bandwagon. If it really rings true to me, or if Set or Osiris confirms that the UPG is valid/useful for me, I will then start to incorporate it into my practice. However, if a piece of UPG doesn’t work for me at all (such as the Set and water thing mentioned above), then I don’t bother with it at all. You should never, ever feel pressured to incorporate someone else’s UPG or doxa into your religious practice. Do not let anyone ever tell you that you have to follow their UPG. UPG is called “unverified” for a reason. How much you rely on other’s doxa, or even your own doxa- is entirely dependent upon you. You don’t have to incorporate doxa or UPG into your practice in order to be a successful Kemetic. As with most things, I do believe that balance is key, and figuring out what balance works best for you is imperative. Because your balance is your own, no one can tell you how much to keep or how much to leave, but keeping an open mind and learning about modern and historical practices will serve you well in discovering your own balance. See the KRT Master List for this topic by clicking here. For those who are confused…. What is common sense anyway? Long before I came to Kemeticism, when I still identified as a Wiccan, my SO concocted a rite to do for Osiris, which he taught to me. I can’t really say where he got the idea from- neither of us really knew much about Kemeticism or its holidays. But the rite seemed to fit, and the more I’ve learned over the years, the more I see the correlation between it and the Mysteries of Osiris. I had written about my rites briefly last year, but this year I’d like to do a full ‘tutorial’ on the rites I perform every year for O. This is based entirely off of UPG, but I think that this UPG is rather applicable to this holiday. The rite I’ve written out below isn’t exactly the original format- the ritual has grown and changed a little bit over the years that I’ve done it. It’s a growing practice and feel free to modify it to fit your needs as well. The first step is to cleanse yourself in whatever format you feel works best. You will then want to cleanse your shrine area and icon as well. This can be as simple as wiping it down with a cloth, or going as all out as using natron, incense, etc. Then, create mound of sand in center of shrine area. In my case, I placed the sand in a small dish- so that it wouldn’t go everywhere. I use the sand for multiple reasons. One, it purifies the area. It creates a clean space to place the icon on (this was typically done in the Opening of the Mouth rites as well (Eternal Egypt, 292)). For me, the mound of sand recalls Zep Tepi, the first time. It stands for rebirth, change, and growth- which is what the Mysteries is all about. 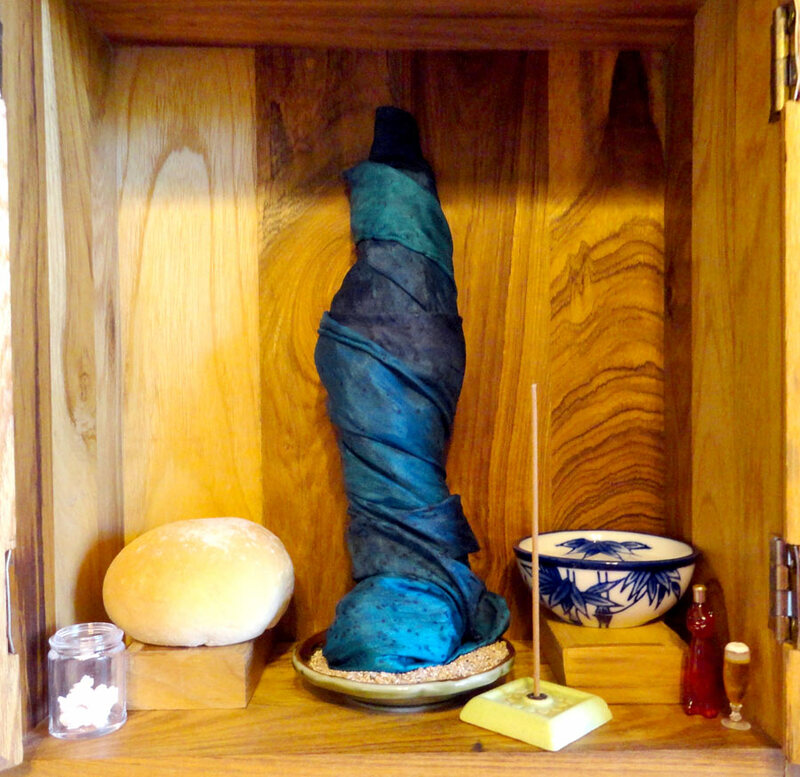 I then take my icon, and wrap it in its entirety in a specific blue cloth that I have. This cloth is only used for this purpose. I don’t use it for anything else. Originally, the blue represented the water. For me, Osiris is the river, it is his domain (and in some cases, the location of his felling), so the blue made perfect sense. According to Wilkinson, the color blue could “represent the heavens as well as the primeval flood, as will be seen, and in both ways it functioned as a symbol of life and rebirth. …Blue could represent the river Nile and its associated crops, offerings and fertility..” Once again, we have rebirth as the theme. If you don’t have a blue cloth, I think the next best choices for colors would be green (for the vegetative aspects of the Mysteries), black (for the black fertile silt that allows the crops to grow) or something that is remniscent of the sky or Nut- such as a cloth with stars on it (this is tied to the Imywt fetish and also the practice of painting Nut on the lids of coffins- she is often used as a vehicle for his rebirth). You will then place icon on the mound of sand. Djehuty has come to you. Awake when you hear his words. I have come as the envoy of Atum. My two arms are upon you like those of Heru. My two hands are upon you like those of Djehuty. My fingers are upon you like those of Anpu. 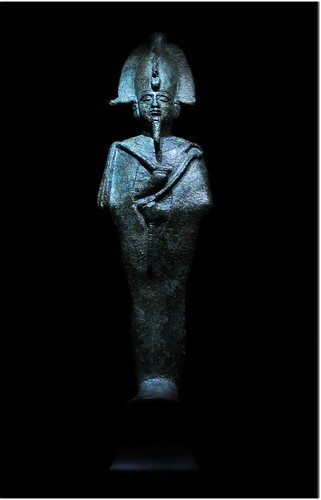 Homage be to you, I am a living servant of Osiris/Wesir. I then present offerings to Osiris. These are to accompany him during his trip to the Duat. Typically, I will offer incense, water and bread. I think that flowers would also be appropriate. Use your discretion, and use something that won’t go horribly bad if left out for quite a while. And, yes, Re-ment is still an option here. You can present these offerings with words, or without. 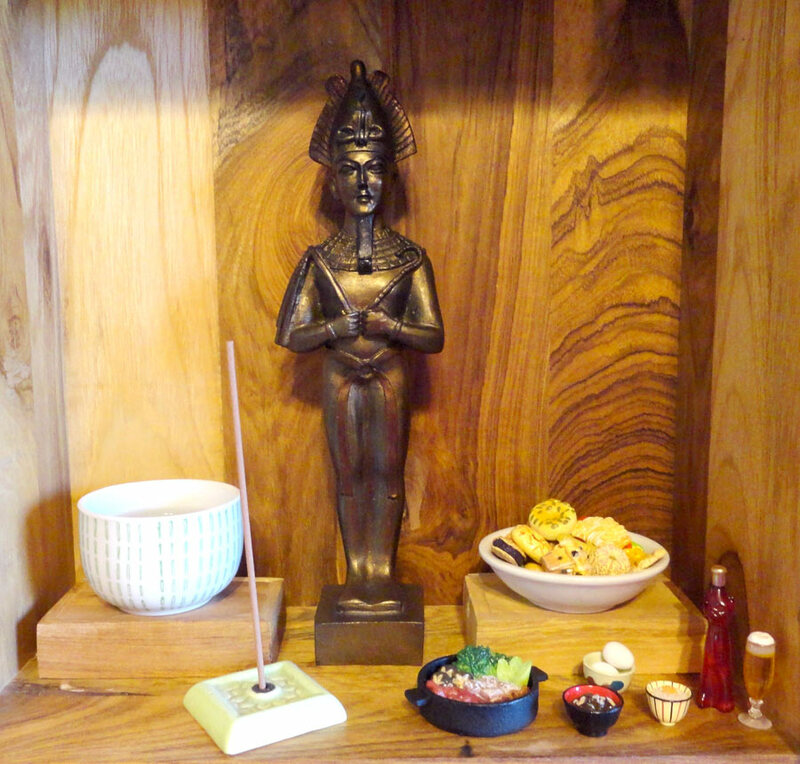 I then close up my shrine for the duration of my celebration (which I celebrate for a full month- New moon to new moon). If you don’t have doors, I’d recommend draping a cloth of some type over the shrine. I do this for a couple of reasons. One, this is the time when Osiris is gone. He’s been taken from us, he’s in the river, Aset is searching, Heru and Set are battling it out- it’s a time of chaos and loss. This is the field after the seeds have been planted. You know that the seeds are there- but you can’t see the plants just yet. The whole purpose is to notice a loss. And for me, it doesn’t really sink in as a loss until I can’t see him for such a duration. For my own personal practice, the point is to mourn his loss. You can’t mourn him if you can go see him in shrine (see the icon) every day. Second, I go a full month for cycle and completion. The moon disappears during the New Moon phase, as Osiris has disappeared from us. And I feel that waiting out the full cycle of the moon helps to bring out the full cycle of rebirth that Osiris goes through. 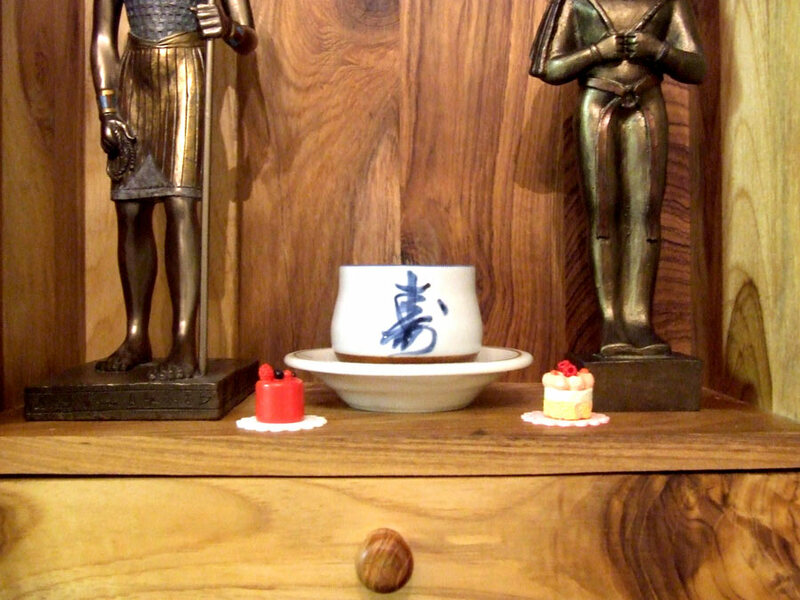 I then place my Anup and Aset statues on top of my shrine. If I had a representation of Nebhet, I’d place her there, too. These three are heavily laced with the mythology of Osiris. Anup helps to protect and embalm Osiris. He helps Aset and Nebhet find pieces and put him back together. Aset and Nebhet are the primary mourners of Osiris’ loss. So I like to involve them in the process. I keep the shrine closed for the full month. 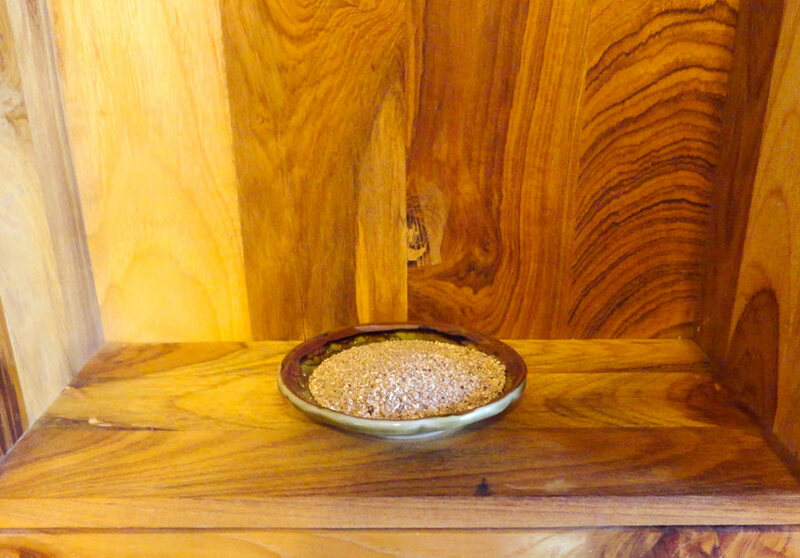 During this time, I will leave offerings on the outside of the shrine. Offerings could be of any format- words, food, candles, items- whatever. I usually use this time to notice how my practice and life feel different without him being right there. I usually reflect on the nature of death, rebirth and sacrifice. Once the month is up, I open the shrine, revert the offerings (I typically won’t eat these ones :P), unwrap the statue and set the shrine back up in its normal format. 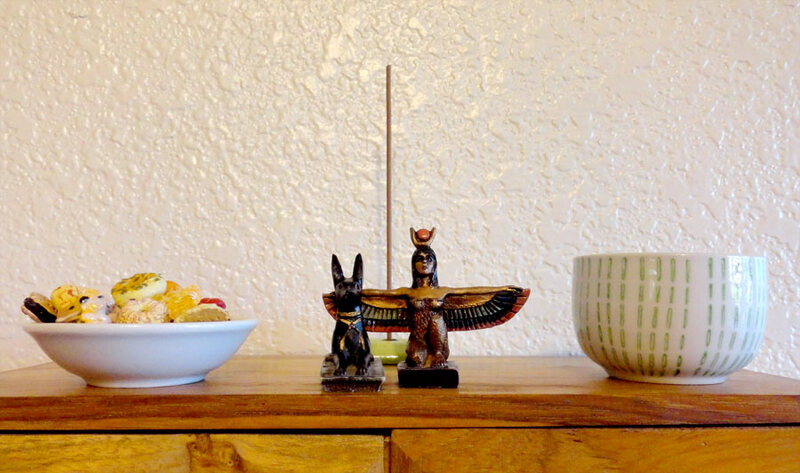 I then lay a big spread out for Osiris and celebrate in his return, his rebirth. I know that many people don’t consider Osiris’ mythos to be that of rebirth, but for me it plays a heavy role. I tend to work with Osiris as a vegetative deity. A god of the land, of agriculture. He is the land of Egypt. He is what sustains the people. And every year, the river, land and vegetation of Egypt go through a cycle of death and rebirth. The river recedes, the land dries up, the plants die. And then the waters issue forth in the inundation, the silt is deposited, seeds planted, live is grown, cared for and cut down to feed the people. For me, he is intrinsically linked to all of this, so most of my rites to him involve layers of death and rebirth- as well as sacrifice, as he has to sacrifice himself so that others may live. Please let me know if any of you try this format of ritual and the type of response you get from it. I think that the Mysteries can have a profound effect on you, as you continually consider what life and death mean to you, and the fact that death must occur in order for life to continue. I’d love to hear anyone’s experiences from any Mysteries rites that participate in this year! 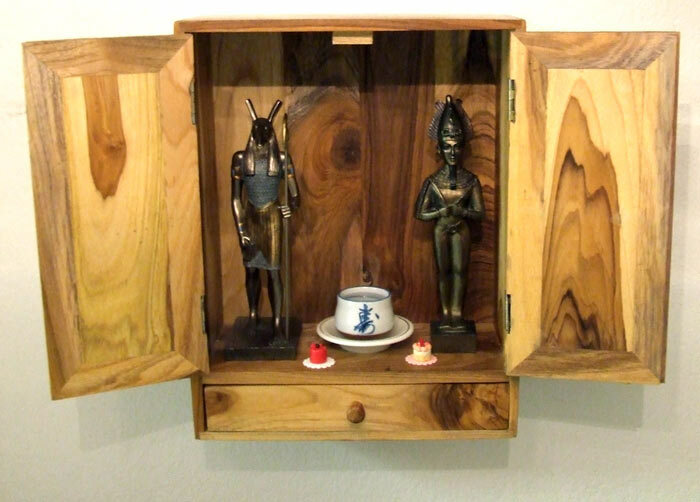 Also, please check out my article about this over on Shrine Beautiful. There are more pictures of my setup there for you to enjoy! I’ve just finished reading Reflections of Osiris: Lives from Ancient Egypt by John Ray. I wasn’t sure what to expect from this book originally. I thought it could be dull or completely unhelpful to hear stories of people who had lived in AE. However, I was pleasantly surprised by the book. Ray writes a lot like Barbara Mertz and that makes the book more enjoyable for me- as the text isn’t so academic and dry. Now most of these stories I had already heard. We all know about Imhotep, the angry mummy who wants his woman back awesome guy who helped build the pyramids. And you can’t read anything without hearing about the ‘female king’ Hapshepsut. And I had even heard of Hekanakhte through Mertz and Petiese from Sauneron. And the people at the Serapeum are very well known (this relates to two twins who were slighted by their mother. In order to save themselves from starvation, they become part of the cult of Apis at the Serapeum). However, despite knowing most of these stories and people- this book really does cast them in a different light. Most times, the history around these people is presented in a very cut and dry method. So and so did this, this, that, and that. And that’s it. However, Ray does a great job at making the stories more engaging, and bringing the characters to life. He also discusses these people in a more indirect way. He doesn’t just talk about the people- he discusses what is going on at the time in Egypt. He shows how the political events of the era could influence the people we are reading about. He puts the people in their time and place- and paints a much broader picture than most historians. And for me, these stories seemed more real; they had more depth to them. And in some ways, I understood a bit more about how things can be effected by the surrounding areas. As you can tell by the quotes above, the writing style is approachable and easy to read. And in many cases, you feel like the author is being straight with you. He doesn’t have an agenda to push, or any theories he’s trying to prove. He’s just telling you how it is. I particularly liked the mention at the end of Nectanebo’s chapter- where he relays that the reason we don’t have the end of the story is because the young boy who was translating the story got bored, and decided to draw some weird doodle face instead. 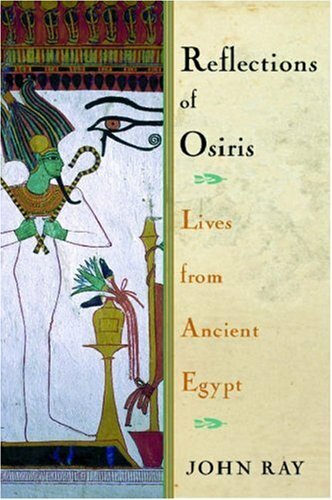 If I had to give any critique to the book, it would be that I wanted to hear more about Osiris. I understand why the author chose the name that he did. And I know the book is more about the people than the god- but there was a chapter at the end about Asar, and it was severely lacking. I would really really really like to find a book that actually goes into the deity himself. The other thing that might be an issue for some is that the stories/people covered in this book are pretty well known. I have no clue if we have records of people who are more obscure- but it would be cool to see stories that are less well known. However, I feel that the book is worth reading, and it offers a slightly different perspective than most. The book is more useful for historical references and ideas than for religious ones, but I still think there is interesting information in it. 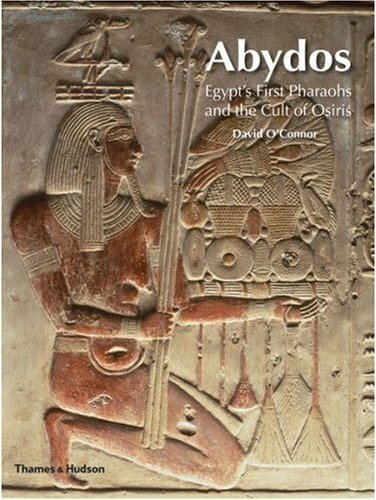 Today I will be reviewing the book “Abydos: Egypt’s First Pharaohs and the Cult of Osiris” written by David O’Connor which can be found here. If you have any interest in Abydos or early Egyptian tombs/structures, this would be a good book for you. The information is well written and seems to be pretty bias free. The author is very good at stating what we know, what we don’t know, and his thoughts on what might have happened. He doesn’t present his theories as truths- which is something a lot of authors have a problem with. For this reason alone, I would recommend this book. However, there is a lot of useful information in general. I learned quite a bit about Abydos- it’s structures, it’s history. The only thing I would have liked to have learned more about is Osiris- his cult and how his cult interacted with Khentiamentiu. However, there is still a fair amount of information regarding Osiris’ cult and his temple (I just want to know MOAR). He goes in depth about the history of Abydos- from dynasty 0 all the way to the Late Period. He discusses various building projects there, talks about the layout and designs of many of the temples, the anomalies of some of the structures and what we can learn from them. Considering that Abydos is usually only mentioned as being “Osiris’ city” or the place where Seti built that big temple with the kings list- it’s nice to see a more in depth approach. Of course, as O’Connor mentions in his book- you find some answers, only to come up with more questions. I, too, have more questions for having read this book, but I have more answers too. The vast cemetery field comprising the Middle and North cemeteries and Umm el Qa’ab was personified as Hapetnebes, “Shoe who hides her lord”, a term peculiar to Abydos. The endless, open desert plain of Abydos was imagined to be a goddess, generated by & embodied in the landscape itself. “She who hides her lord” was complex in meaning. At one level, this goddess as landscape literally hid and thus protected Osiris himself- buried at Umm el Qa’ab – as well as his countless followers, eash one also an Osiris entombed in the Abydene cemeteries. But Hapetnebes was also a more positive force in that Osiris, buried within her, experienced revitalization or rebirth every year. In this perspective, “She who hides her lord’ is virtually lanscape conceited of as a mother goddess, in whose womb lies the potential for and actualization of life. She thus relates to the subtle interplay of meaning btwn desert and floodplain in the prototypical Egyptian landscape. The desert, seemingly dead, generates life for Osiris and deceased Egyptians; and thus relates to those more obvious manifestations of vitatlity and reproduction, the inundation and consequent vegetation, both seen as manifestations of Osiris’ capacity to regenerate. He also discussed a bit about what we modernly call the Mysteries of Osiris. As I mentioned in on of my last posts, it was common for the Mysteries to involve a procession that started at Osiris’ temple and worked towards Umm el Qa’ab- what was believed to be Osiris’ tomb. During the procession, agents of Set would try to stop these people by attacking them. Of course, Osiris’ “team” would win, and they’d make their way to the tomb where rituals were more than likely done. This was also an interesting tidbit to learn. I think for me, besides the two nuggets above, the biggest help this book served for me was to learn about early dynastic pharaohs. Most authors completely skip over early and pre-dynastic Egypt. More or less saying that they were there, stopping to look at Menes, Scorpion King, Narmer Pallete… and then moving on. If you’re lucky, you might see “Naqada” listed. However, O’Connor does go pretty deep into early dynastic goings on in Abydos (at least in regards to the structures there). So I feel like I’ve had a huge history gap somewhat filled. I know that this comes with the territory- Abydos housing tombs for early kings and all, but it was still nice. Overall, I would recommend this book. It’s well written. Has good info. And if you’re into Osiris or Abydos in general- it helps to give a more complete picture of both. The author is respectful of his subject matter, and I think he approaches the topics that he discusses really really well. So go read it! See this review on Pagan Book Review!